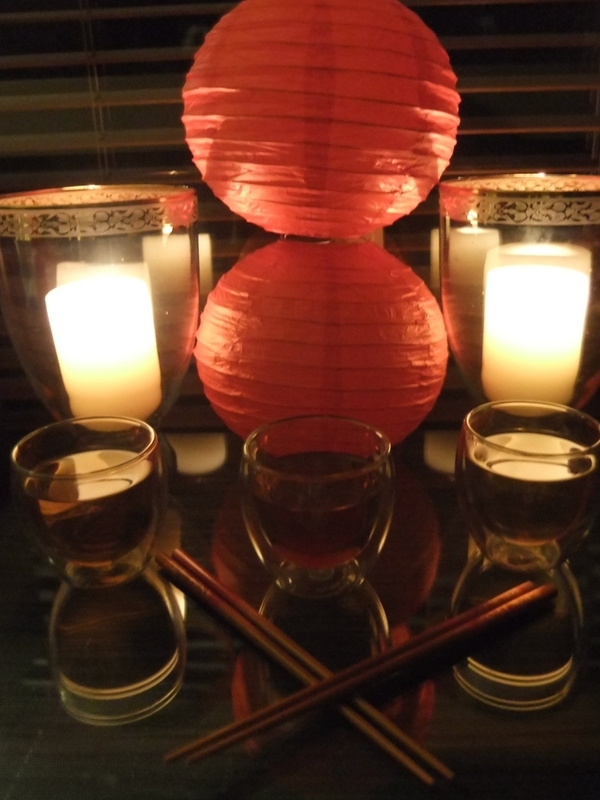 HAPPY CHINESE NEW YEAR (2013)! The Dragon has exited and the Snake has entered! 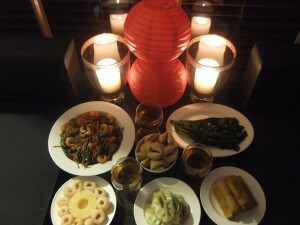 This year, Chinese New Year occurred on 10 February 2013. Also known as Lunar New Year and the Spring Festival, Chinese New Year is the most important and significant event on the traditional Chinese calendar where deities and ancestors are honoured. A lot of these celebrations occur around food. The types of foods that are prepared and served are foods whose Chinese pronunciations sound similar to other words (ie/ homonyms) that relate to fortune, happiness, longevity and prosperity, or foods that have a symbolic meaning. The Chinese myth that Emperor Shen Nong discovered tea in 2737 BCE has been universally accepted as the beginning of tea’s journey in our world. 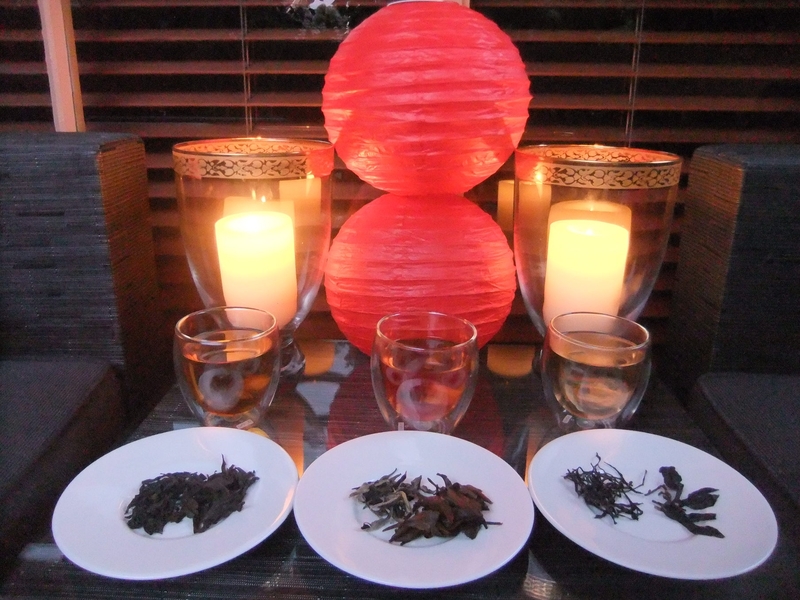 We thought it would be fitting to pay homage to tea’s Chinese origins and celebrate Chinese New Year with a food and tea pairing and tasting on New Year’s Eve. [* We take this opportunity to thank (profusely thank!) Angelina Yannuccelli, the founder and owner of Tea and Sympathy, for providing us with three of her fabulous specialty teas to brew and taste for this auspicious occasion (thanks Ange!). 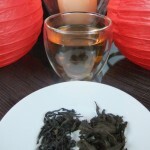 It is only fitting that we unashamedly plug Tea and Sympathy’s fabulous online store: http://teaandsympathy.com.au/]. It was a hot day in Melbourne on this day, so we began with an iced tea served chilled along with fresh fruit, oranges and pomegranate, to help everyone cool down. 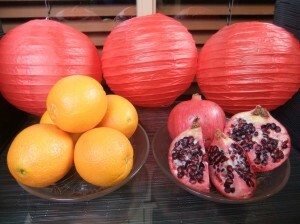 The Chinese word for ‘orange’ sounds like ‘gold’ so oranges symbolise wealth, good fortune and gold. Pomegranates symbolise fertility and seeds (like the many seeds of a pomegranate) symbolise many offspring and bearing many children. Appropriately, we began the salutations with an acknowledgment to wealth and family. (* My ancestors are Greek and family, offspring and children are important in our culture too, and being Greek in Melbourne, there are many branches to our family tree!). 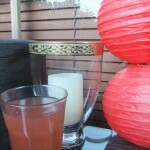 The iced tea was a purchased ready-made iced tea, Pomegranate Lychee Green Tea by POMx. On my first sip I immediately tasted the sweetness of the lychees, followed by the strength of the pomegranate. 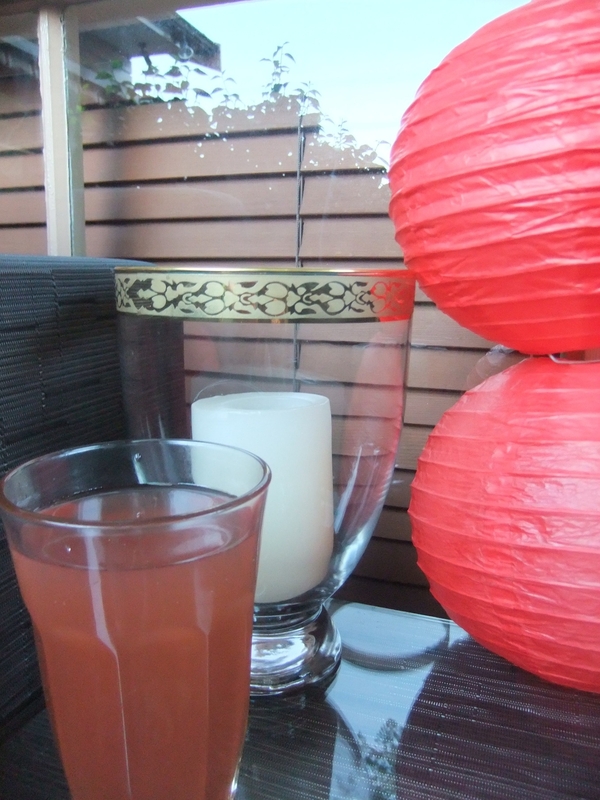 Indeed, this tea drink resembled a fruit punch. It was a refreshing drink to begin with and cool down from the hot Aussie Summer’s day and it was a good alternative to serving alcohol or soft drinks. 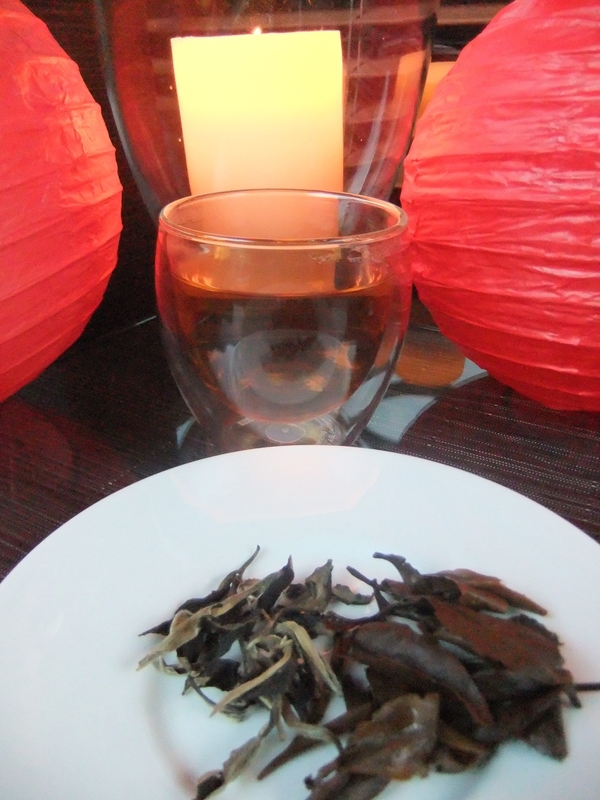 producing exceptional Pu-erh Tea, this white tea was a delight. The dry leaves had a distinct velvet coating and were a multi-coloured mix of varying shades of silvery light green leaves, darker green leaves and brown leaves. Once infused, the wet leaves really opened right up (up to 2cm – 2.5 cm long, 1 cm wide) and transformed into a gorgeous chestnut brown colour. The liquor itself was a stunning glowing golden apricot colour with exceptional clarity (to the point that it was almost radiant!). Its aroma and taste were both sweet with a wonderfully distinct apricot scent and flavour: If stewed apricots were a tea, this would be it! Given the richness of the dumplings and spring rolls, this tea was a great accompaniment to this course as it ‘cleansed’ the tastebuds and left me with a lovely silky yet light coating over my tongue. For main course we cooked two dishes: Noodles that contained mixed vegetables (onions, carrots, zucchini, Chinese broccoli, prawns, and cashews) in a light garlic, honey and soy sauce, and a separate dish of lightly sautéed garlic and Chinese broccoli. Noodles represent ‘long life’ and ‘longevity’ and should not be cut. Mixed vegetables in general symbolise ‘family harmony’. More specifically, carrots represent ‘good luck’, cashew nuts signify ‘gold’ and ‘money’, onions ‘cleverness’ and prawns ‘liveliness’. 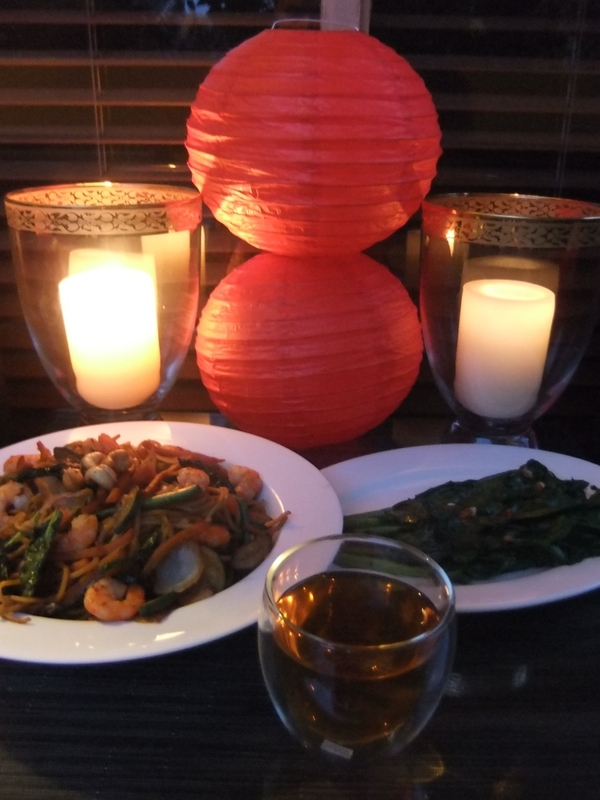 Green vegetables symbolise ‘close family ties’; in particular, long leafy green vegetables such as Chinese broccoli should be served as a whole to wish a long life for parents. 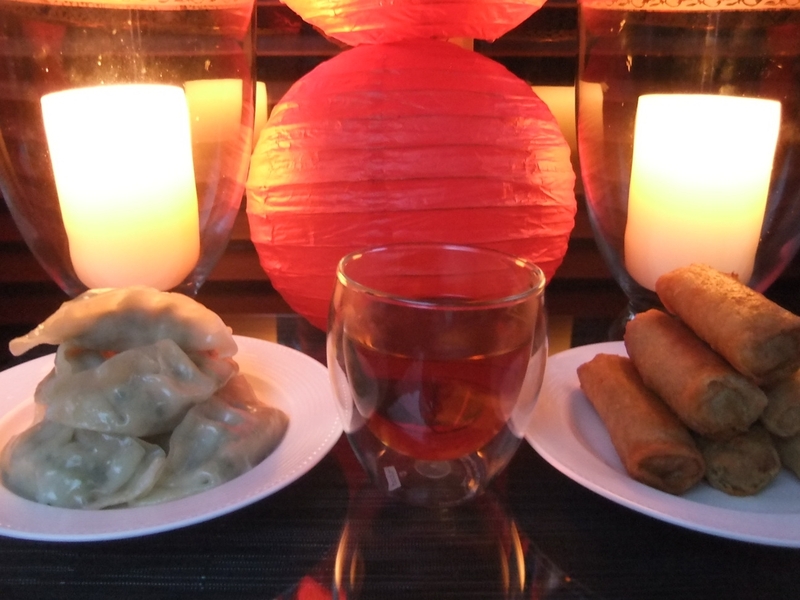 We paired this course with Da Hong Pao (aka ‘Big red Robe’) Tea (also available online from Tea and Sympathy) and wow, what a fabulous pairing! 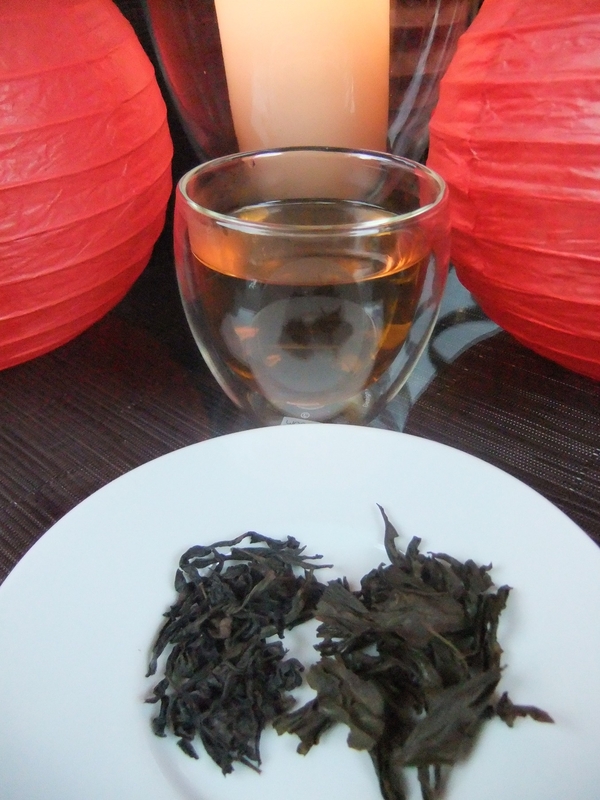 This Chinese Oolong is a heavily oxidised tea from Wuyi Rock, China. Its dry leaves were reddish brown in colour and are tightly dried. Once brewed, the leaves become a kaki green colour whilst retaining the reddish tinge. The wet leaves also opened up to a lovely wide leaf (approximately 2 cm long, 1.5 cm wide). The liquor was a lovely dark amber colour, with great clarity (although not as luminous as the Yunnan White). This was a deliciously complex tea of several layers: Once brewed, the dual sweet and savoury aroma was a wonderful prelude for my taste buds as to what was yet to come. Indeed, this tea had a lovely savoury taste that can only be described as roasted and malty with sweet light honey aspects too (this sweetness shone through more as the tea cooled). It was a wonderful balanced fusion of the ‘darkness’ of the malty notes with the ‘lightness’ of the subtle honey sweetness. It also had roasted rice notes to it although rice had not been added. If ever a tea can be multifaceted this tea would be it! Spectacularly and wonderfully complex! Well suited to the layers of flavour in the food we served. Sweets served during Chinese New Year signify safety, good fortune and are served to ‘sweeten’ the New Year. 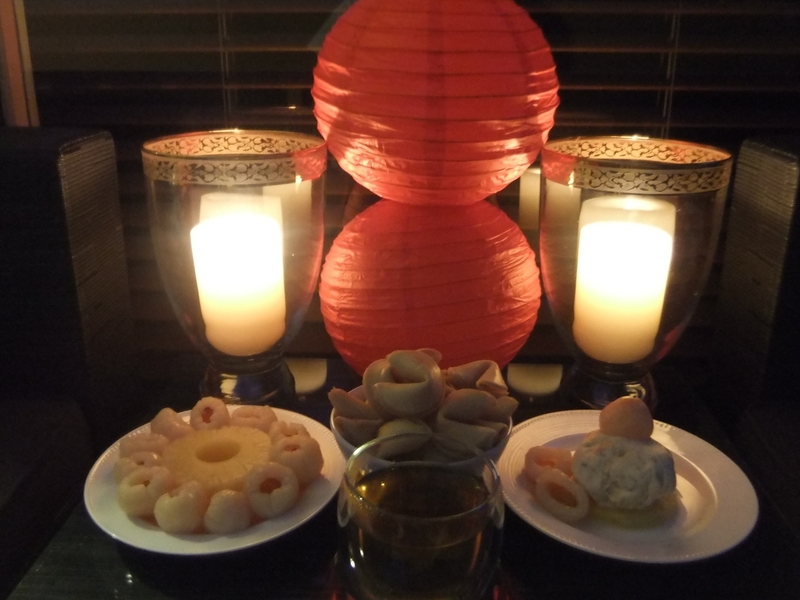 To conclude our evening, for dessert we decided to serve lychees (which signify close family ties), pineapple (which represents wealth, luck and excellent fortune) with some cashew ice cream (once again, cashews signify gold and money). Following the rich foods of the previous courses this was a simple yet refreshing and cleansing dessert. Dessert was paired with a Purple Beauty Oolong Tea (also available online from Tea and Sympathy). 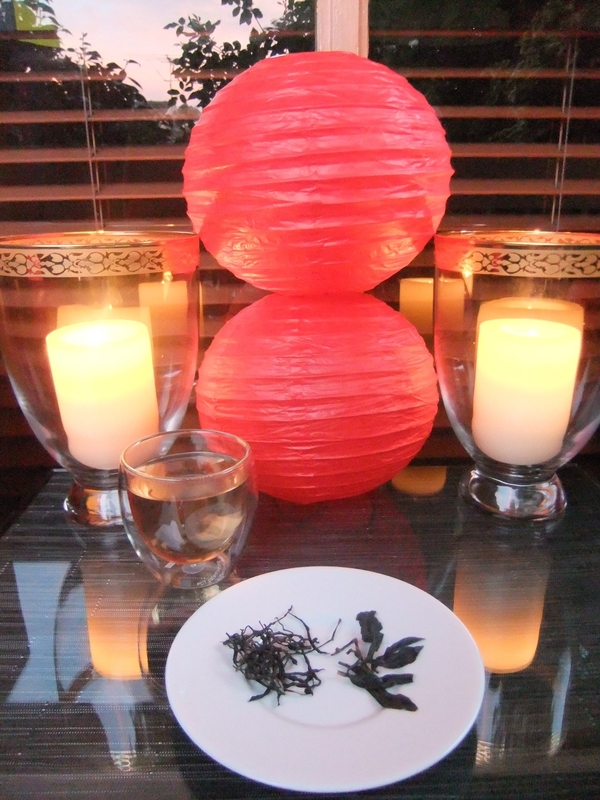 The long, thin, spindly dry leaves of this tea looked spider like and were an amazing visual! This tea had a delicate sweet aroma with a hint of lavender, and this delightful aroma was sensed not only in the wet leaves but equally in the dry leaves. This tea was a full leaf tea so given enough room to brew (we used a pot rather than a cup), the leaves opened right up to 4 cm – 5 cm in length, and up to 1 cm in width. 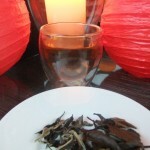 But it was the colour of the wet leaves that gave this tea its most extraordinary characteristic: They become purple! Aptly named, this tea really is a purple beauty! The liquor was yellow in colour and had a slight hint of cloudiness to it. It had a subtle taste, sweet with that lovely whisper of lavender. Admittedly, this tea was trickier to brew in comparison to the others, however, after a few attempts, when the leaves opened right up, it was indeed impressive and well worth the effort. 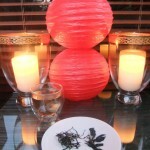 Wishing you and your family peace, prosperity and pleasurable tea experiences!